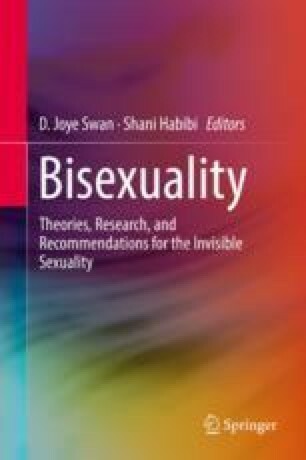 Research indicates that bisexual individuals face unique stressors due to the stigmatization of bisexuality (i.e., negative attitudes toward and stereotypes about bisexual people, referred to as binegativity) and these stressors contribute to the health disparities that they experience. It is critical to understand the components of binegativity and factors that influence binegativity in order to develop effective strategies to reduce this stigma and resultant stressors that contribute to health disparities affecting bisexual people. The objective of this chapter is to review the empirical research on binegativity, including its core components and correlates, as well as promising interventions for reducing this stigma. Several conclusions can be drawn from our review. First, binegativity includes hostility toward bisexual people, stereotypes that bisexuality is an unstable and illegitimate sexual orientation, and stereotypes that bisexual individuals are sexually irresponsible (e.g., unfaithful in relationships, have sexually transmitted infections). Second, there are gender and sexual orientation differences in binegativity, such it is more strongly endorsed by a heterosexual individuals compared to gay and lesbian individuals and among heterosexual men compared to heterosexual women. Heterosexual men also report more negative attitudes toward bisexual men than toward bisexual women. Third, binegativity is associated with other factors, such as demographic characteristics (e.g., older age; and lower income and education) and conservative beliefs. Fourth, experimental studies confirm self-report findings that bisexual individuals are perceived more negatively than gay, lesbian, and heterosexual individuals. Finally, research is beginning to develop strategies to improve attitudes toward bisexual individuals (e.g., intergroup contact and multicultural education), which have the potential to reduce health disparities affecting this population.